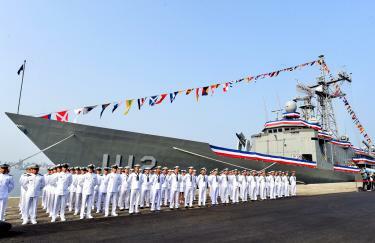 step” in defending itself as she inaugurated two frigates purchased from the US. The two Perry-class guided missile frigates were commissioned in a ceremony at the Zuoying naval base in Kaohsiung. Built in the 1980s, the frigates were originally named USS Taylorand USS Gary, and were part of a US$1.8 billion arms deal to Taiwan announced in 2015 under then-US president Barack Obama. They have been renamed Ming Chuan (銘傳) and Feng Chia (逢甲). They have “high mobility, high sea resistance and low noise,” and are fitted with the SQR-19 sonar system currently used by the US Navy, the Republic of China Navy said.